This fabulous three bedroom fifteenth floor apartment is presented in wonderful condition throughout and features three stunning winter gardens with fabulous river and city views. Situated on the banks of the Thames, Battersea Square is easily reached for cafes and restaurants, as well as a selection of amenities within Wandsworth Town and nearby Clapham Junction. Wandsworth Town is the nearest station for National Rail links. 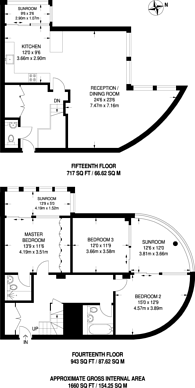 1,660 (154 Sq M) approx.